In honour of the upcoming Canada Day holiday, I thought it an appropriate time to feature a couple of recent Canadian vintage and thrifty finds of mine from local Toronto thrift stores. I’ve alway wanted a vintage Hudson’s Bay Company multi-coloured striped wool point blanket, thinking that perhaps one day I’d wander into a charity shop and find one for the amazingly low price of ten dollars. Well that vision came true – sort of. 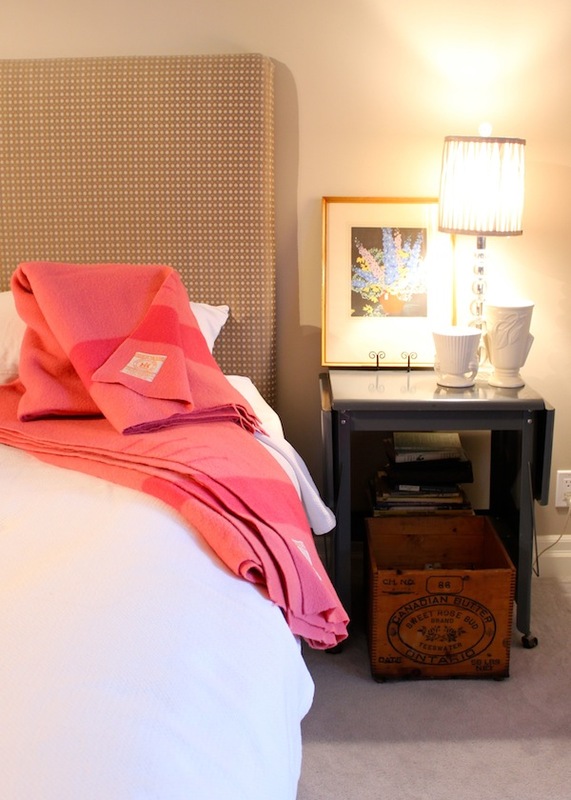 I am now the proud owner of two single-sized pink vintage HBC blankets. I have a queen bed and no twins, and pink is nowhere in my decor. But in essentially perfect condition and spotted for $9.99 each at a Salvation Army store, I couldn’t pass them up, when this size and vintage of point blanket can retail in an antique / vintage shop or online for $100 and up. From my research about the colour and the label reading ‘100% wool’ but with no French, I figure they date from 1950 to 1970. 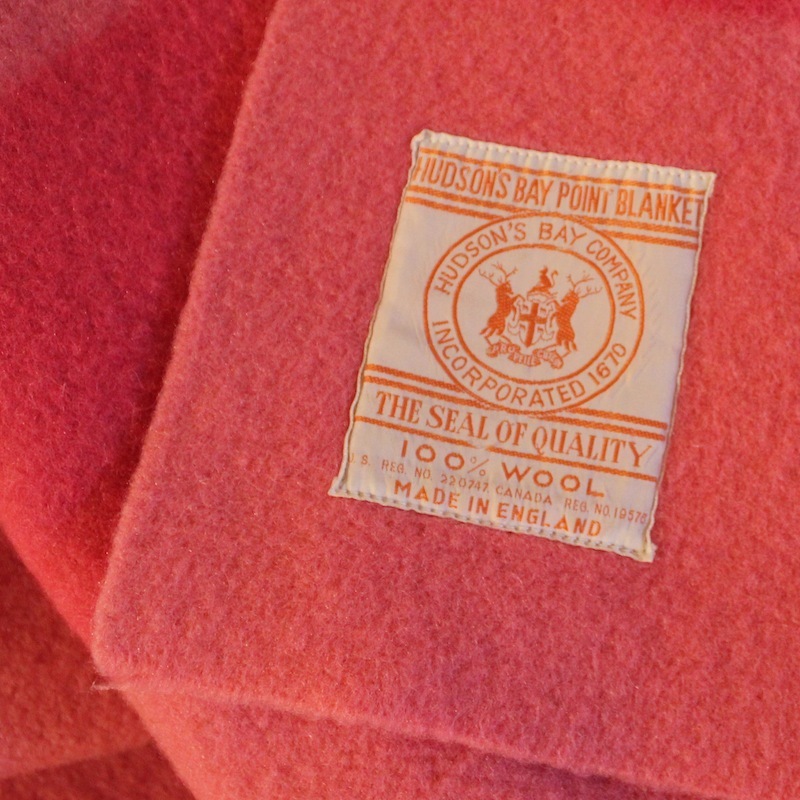 Visit The Point Blanket Site for more information about the history of HBC point blankets and identification. I think it’s time to add some pink to my colour scheme. 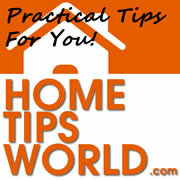 Another colour that generally doesn’t enter my decor or wardrobe is red. I know, not so Canadian of me, but for some reason red just isn’t pleasing to my palate or palette. 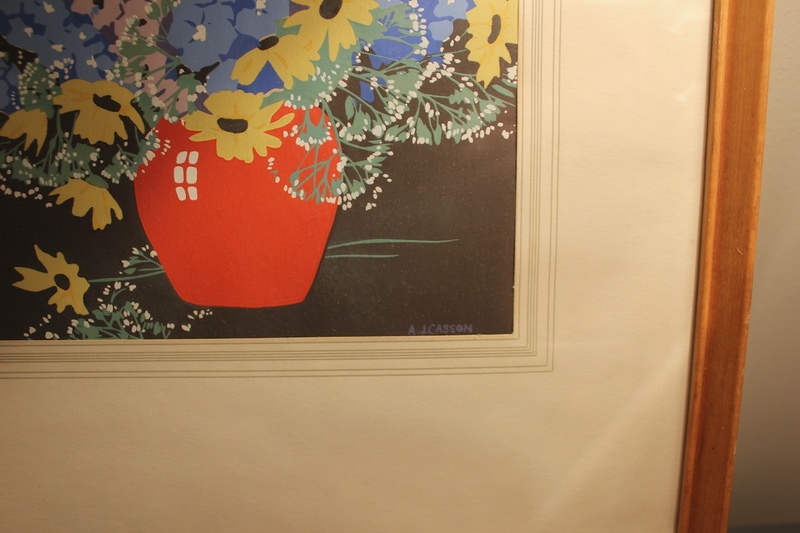 However, this bit of red in this divinely thrifty find of an AJ Casson lithograph/serigraph is just fine by me. 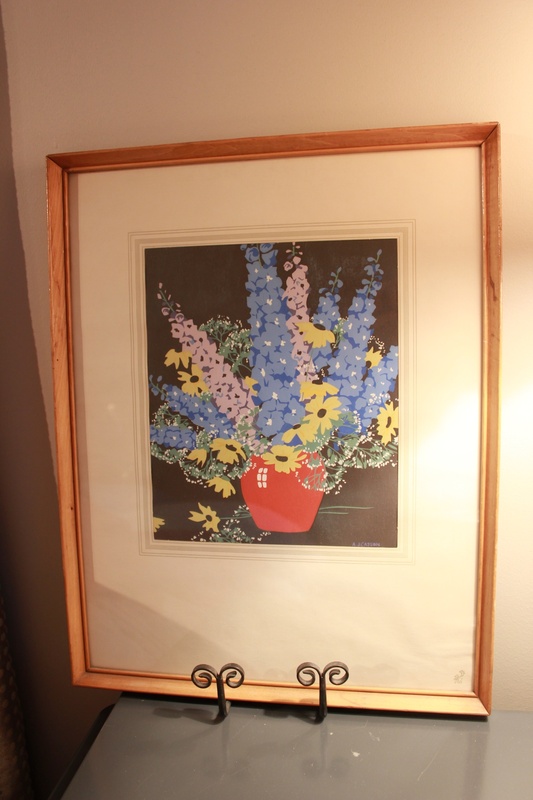 This pretty little floral arrangement of delphiniums and other blossoms is likely from the mid 20th century and yes it is by that Andrew Joseph Casson of the Group of Seven. I’ve not yet opened it up to see what markers may be on the backside, but is signed in the print and is in the original frame. Again, from some of my preliminary research it may well be worth a few hundred dollars. A little bit of an Antiques Roadshow moment for me, as I bought it at a Goodwill on a half-price day for, get ready for it – $2.50! Oh you doth flatter. 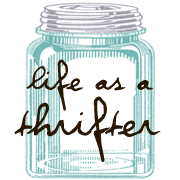 As you know in thrifting it’s being in the right place at the right time. 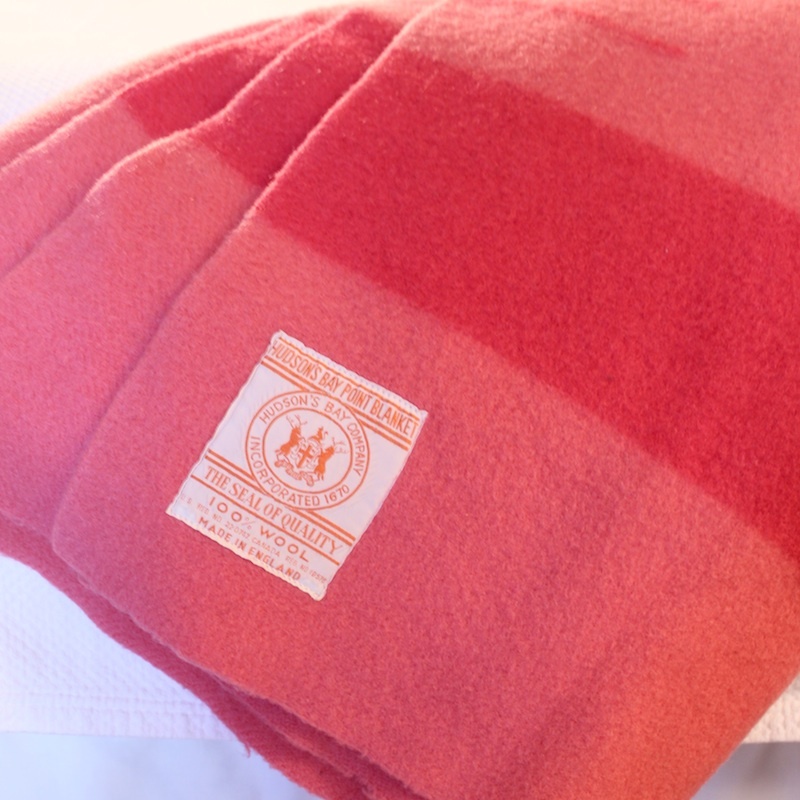 I had no idea that the HBC blankets came in pink either – and as I’ve discovered many other colours too. So pretty! Score!!! Love the print…well done.